Location : On Sansad Marg and opposite NDMC building. Maharaja Sawai Jai Singh II, who built the observatories in northern India, was born at AMBER (Near Jaipur) in 1686 AD. He was the eldest son of his father Maharaja Vishnu Singh. He became King of Amber in 1699 A.D. after the death of his father. He saw the rule of five Mughal emperors during his regime (1699-1743). In 1707 AD, he won the areas of Amber, Sambhar & Ajmer from Mughal forces under Emperor Bahadur Shah I. 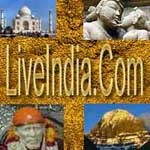 He was granted governorship of Agra and Malwa provinces by emperor Muhammad Shah in 1719 A.D. This ' heart shaped ' instrument is situated in the middle of Misra Yantra. The stairs in the centre divide this instrument in two parts. The walls housing the stairs are exactly similar in all respect to the walls on eastern and western edges. There are four graduated semi-circles in this instrument which are in different planes. The centers of these semi circles fall on middle walls where two holes are provided for fixing a pointer or a rod for observing its shadow on these semi-circles. This instrument was renovated in 1950 AD when graduated marble stones were fixed on all semi-circles. When a pointer of about one foot height is held in the western hole of the wall, its shadow falls on the western semi-circles in the morning hours.The shadow falls on outer semi-circle (marked as A) at 6.52 a.m. Delhi's local time indicates mid day at NOTKEY in Japan. When the shadow falls on inner semi-circle (marked as B) at 7.24 a.m. Delhi local time , it indicates mid-day at SARTICHEW, a town at PIC ISLANDS in the Pacific Ocean. Similarly when the pointer is held in the eastern hole, its shadow falls on eastern semicircles in the afternoon.The shadow falls on inner semi-circle (marked as C) at 4.36 p.m. Delhi local time indicates midday at ZURICH in Switzerland. The shadow at 5.08 p.m. Delhi local time (5.30 p.m. 1ST) falls on outer semi circle (Marked as D) indicates mid-day at GREENWICHn England. Interestingly all these places have ancient observatories. 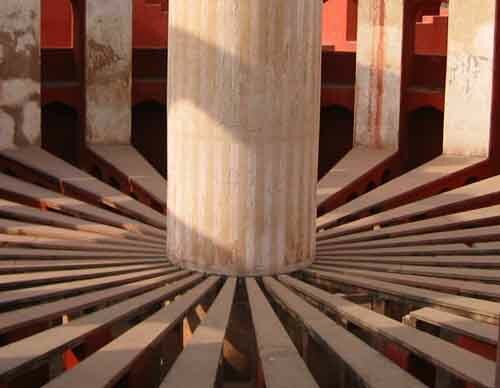 Jantar Mantar literally means 'Yantra Mantra', that is calculations with the help of instruments. 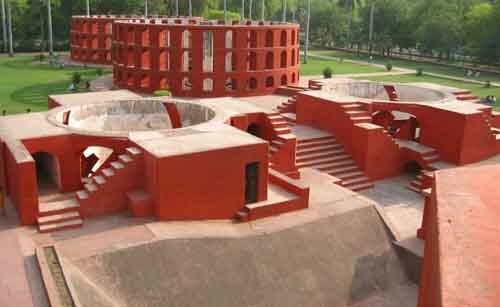 Jantar Mantar was built in the outskrits of Shahjahanabad in 1724 A D after seven years of observations and recordings of data using various models. Maharaja Sawai Jai Singh II earlier used brass instruments but later built huge masonry instruments as he found brass instruments unsatisfactory. 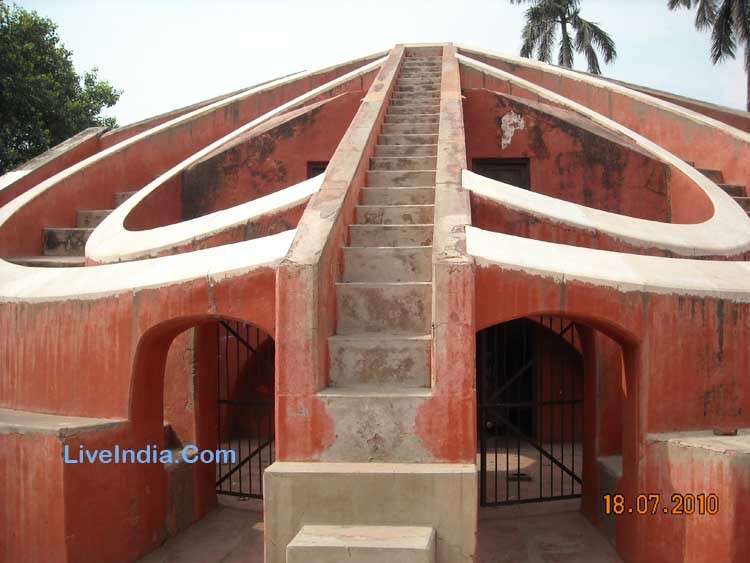 Delhi observatory or Jantar Mantar was constructed on an experimental basis. Astronomical calculations obtained with the help of this observatory were termed as ' Zij Muhammad Shahi1. Maharaja Sawai Jai Singh II himself invented instruments like Samrat Yantra, Jai Prakash Yantra and Ram Yantra. Misra Yantra was probably added later by his son Sawai Madho Singh. In 1795 AD, Franklin visited this observatory and commented "Jats under the leadership of Jaswant Singh had destoryed the observatory. ".